When my husband and I moved into this house, I was excited to find four big square planting containers in the yard. I moved them to the steps leading up to the house, and there they have sat, waiting for me to finally do something with them. 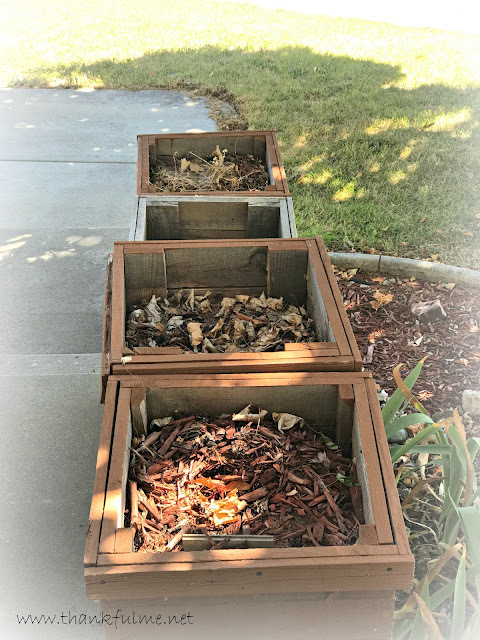 I did plant some bulbs in one of them last fall, but the blooms didn't last long, and I want the boxes to look good for more than one season--and without constant attention from me. I'm glad I waited, though, as it gave me time to observe that the boxes get only partial sun during the time of the year the maple tree in the front yard is in bloom. I'll have to find someplace else to plant roses. After thinking about what would grow well in a container in partial shade, and what would give multi-season interest, I decided to plant yew, specifically dense spreading yew (taxus x media 'Densiformis'). I probably would not have chosen it if we still had young children at home, as it is toxic if ingested, but as we are empty-nesters and long-distance grandparents, I think it's a safe choice. This particular yew, from what I've read, does well in containers and partial shade. It is evergreen, and produces red berries in the winter. The needles are soft to the touch. It can be pruned, though I will probably only occasionally trim it and basically just let it do its own thing--which, by the way, is my philosophy when it comes to my hair, too. 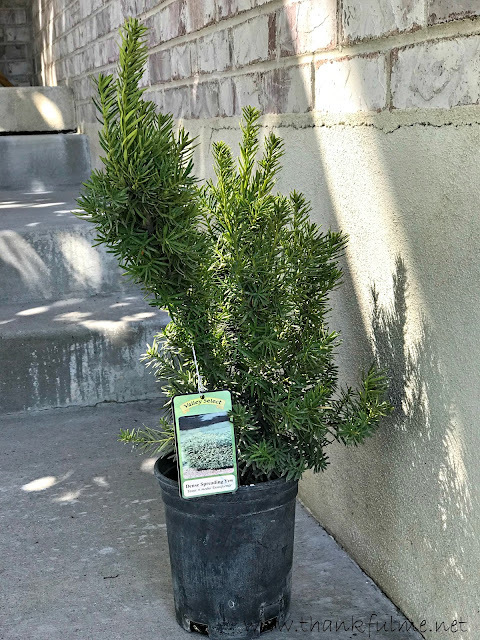 I searched for yews at several nearby nurseries, but only found them in 5-gallon containers, and I didn't want to pay 5-gallon prices. Finally, I found a nursery that had what I wanted in a smaller container, for a third of the price. Unfortunately, they only had one plant left. I went ahead and bought it, figuring getting something growing in one box was better than keeping all four empty until spring. After I got it planted, I realized I could take cuttings and try to propagate additional plants. If it works, come spring, I will have four containers of plants for the cost of one little yew. Check back in the spring! What container plants are you thankful for? 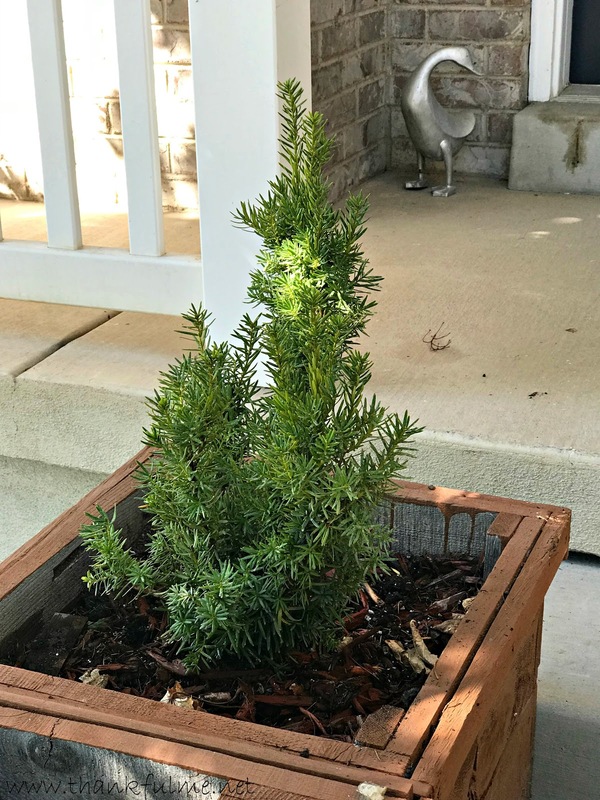 I think the yew will do well in the container. Good luck with the cuttings. Thank you. I hope it does, and I hope the cuttings work, too. Your blog is so much more mobile friendly now! It's awesome. The yew is cute! I couldn’t see the first line until after I tried to comment and needed to log in. 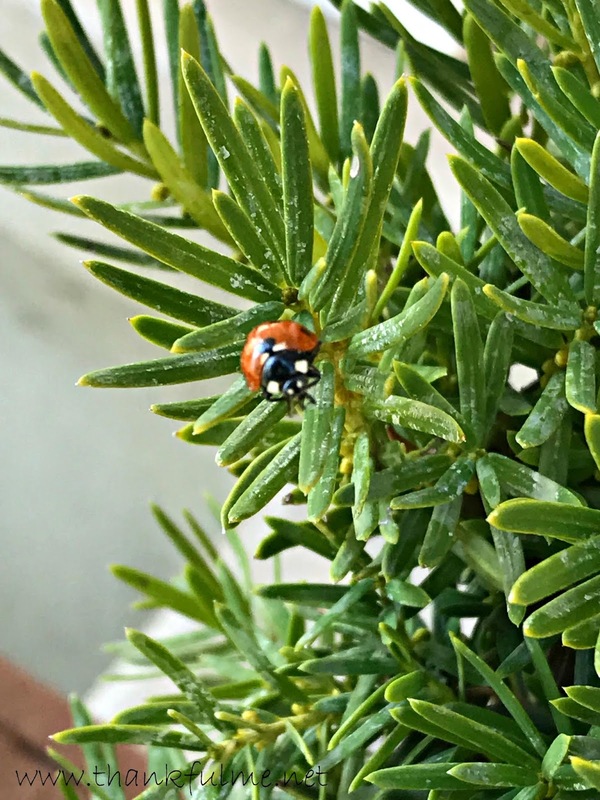 Good choice of the plants too. I don't understand the first line problem, so I'm still unsure how to fix that. I'm glad you could see it eventually, and that you can comment. Thanks! I have a thought on the first line thing... On my screen, it's green like the other highlighted items on the page. Maybe that colored text doesn't translate to all devices? Nice clean look here on the blog. I like the green!